Dragon will be offering a fine 1/35 scale kit of the Sd.Kfz.250/9 Ausf.A le.S.P.W. (2cm) as a complement to its Sd.Kfz.250 family lineup. The le.S.P.W. was a reconnaissance halftrack fitted with a 2cm KwK 38 cannon and a coaxial machine gun in an open-topped turret. The original Ausf.A halftrack featured the same turret as the Sd.Kfz.222 armored car, while the newer Ausf.B adopted a different Hängelafette 38 turret. Several Sd.Kfz.250/9 halftracks were sent to the Russian Front in July 1942 for evaluations, with mass production commencing later. Indeed, the type proved successful and this halftrack variant came to succeed the Sd.Kfz.222 thanks to superior cross-country mobility. To create this variant, there are a number of brand new parts. These include a newly tooled turret – the complex shape had no less than ten armored faces – to accommodate the 2cm cannon and machine gun, plus the new photo-etched mesh for the turret top. This particular turret has no vision blocks. The FuG 12 radio and turret basket are also new for this item. Although the turret may be small, it’s very complicated, yet it has been faithfully recreated in this kit. To fit the turret, the upper-hull plate was extensively modified as well. As part of Dragon’s facelifted Sd.Kfz.250 series, Dragon’s famous Magic Tracks are available. 5 readers have rated this story. Get a daily email with links to all our latest news, reviews, and features. Thanks Carlos, this looks like a definite new add for the stash. Based on the box art, just like their Neu (Ausf B) version, the splash ring forward of the turret is missing. It was in the kit of the other version only by virtue of it being there for other Ausf B versions... The screens do not look high enough in the pic either. The turret is also a later version minus the hatches in the sides. It is only the box art, hopefully the kit itself addresses the issues and has the option for a '2 in 1' different turret. I was waiting à long time for this......but propably Will not bying this because it will cost à fortune...It is cheaper these days to buy An old Tamiya with extras!! 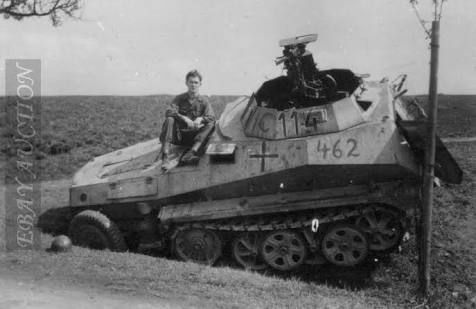 It should be noted that the late version Sd.Kfz.222 turret used on this vehicle used a mixture of low and high mesh screens. Ergo, the image is therefore not necessarily indicative of any inaccuracy. You go right ahead..I'm buying this & will enjoy it. THIS STORY HAS BEEN READ 8,097 TIMES. Submit your own product review!